We’ve developed our Chrome Lead Clipper to quickly pull a lead’s profile information from Gmail, Outlook.com (Office 365 & Hotmail), Xing & Twitter and send them to your OnePageCRM account. 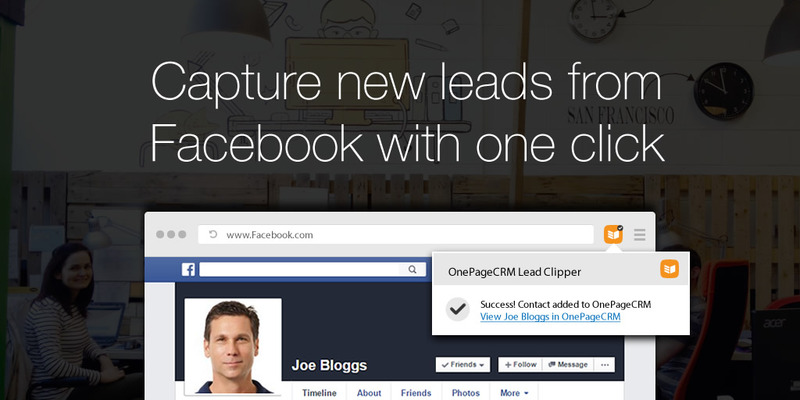 Today’s update means that you can capture new leads straight from Facebook with just-one-click! Streamline your online lead generation today by downloading our Chrome Lead Clipper from the Chrome web store. Let us know what you think of this latest update – comment below or email me at brianm@onepagecrm.com. Does this work with business pages? I would like to clip companies that I want to contact. I don’t always know an individual name. Hi Michelle, thanks for commenting. Right now our clipper doesn’t clip company profiles but it is a good idea. I’ve updated it as a feature to consider in future. All the best, Brian. I´m trying this clipper on facebok, but it doesn´t take the e-mail address from the profiles… How are we supposed to contact these people without the e-mail or mobile? What is the use of it then? Hi Herman, thanks for your comment. Unfortunately it is a limitation from Facebook that we cannot take a contact’s email address. Facebook is best used for discovery of potential leads using their advanced search criteria. Our clipper makes it easy to pull these contacts into OnePageCRM for further research leading to outreach.